I’ve decided to share all my family’s holiday cookie recipes with my readers! I’ll be posting more over the next few days. 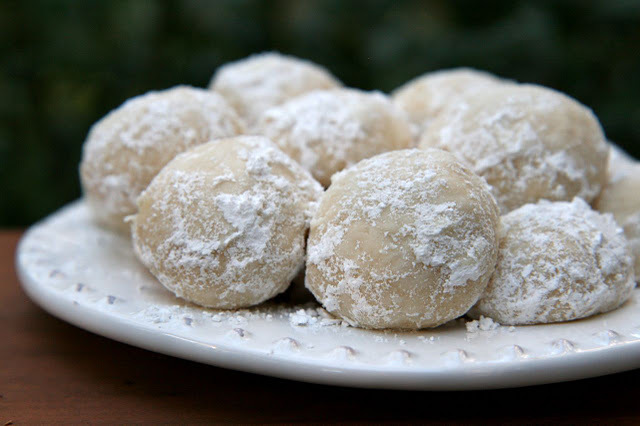 This recipe is for Italian Wedding Cookies, which by nature are given as wedding gifts or eaten at bridal showers, but they are also one of the many cookies Italian families will make around the holidays. 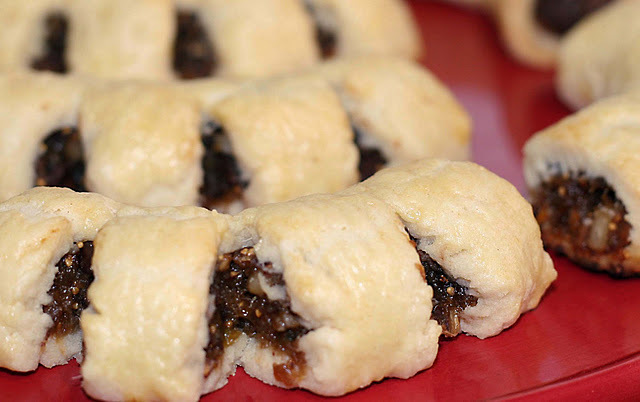 They are very simple to make and delicious with a cup of coffee, espresso or cappuccino. Combine the baking powder and flour in a large bowl. Add the shortening to the flour mixture, working with a pastry blender, 2 knives, or with your clean hand, until it resembles a coarse meal. Add the sugar, then add the eggs and milk, alternating. Stir in the Amaretto, then add the nuts and mix well to combine. Shape the dough into small balls and bake in a preheated 350F oven for 10-12 minutes. Remove cookies to a wire rack set over a piece of aluminum foil (to catch excess sugar) and dust the cookies with powdered sugar when they are still warm, but not straight out of the oven. Makes about 60 cookies. This recipe has been handed down from my great great grandmother, through the generations and branches of the family tree. Where it originated, I can only guess. When I was young, all my great aunts would arrive at my grandmother’s house on a set weekend, with bags of flour, sugar, fruit, figs, dates, chocolate, oranges, anything that was required to make the batches of different Italian sweets they were making. All these Italian women, plus my grandmother who wasn’t Italian but married one, in her kitchen with bouffant hairdos, cigarettes lit in ashtrays, someone mixing toddies and everyone rolling dough. The treat of christmas cookies, because that’s the only time you ever got to eat these, were the fig cookies, also known as “cucidata”. They aren’t cheap to make; my grandmother would start picking up dried figs months in advance and storing in her deep freezer. But they are wonderful. I can give tins of cucidata as Christmas gifts and get more compliments and thank yous than I ever receive with a store-bought gift. So here it is, the family cucidata recipe. This recipe makes approximately 60 cookies. First prepare the filling by washing the figs and removing their stems. Pass through a kitchen style meat grinder (mine is electric, but you could do it by hand), the figs, dates, fruit cake mixture and raisins. Combine remaining filling ingredients with the ground fruit, in a large bowl and set aside. Sift the flour, sugar, baking powder and salt into a large bowl. Add shortening and cut in with 2 knives or a pastry blender until the texture of coarse meal. Sprinkle with 1 cup water and toss lightly with a fork to mix. Add remaining water, tossing to mix, until dough will hold together when pressed. Dough will be firm and slightly ragged. Place ¼ of the dough on a lightly floured surface and roll into a 12 by 18 rectangle, about ‰ inch thick. Cut into 6 3-inch wide strips. Spread 4 tablespoons of the filling down the center of each strip, leaving about 1 inch on each side. Moisten sides of strip with water, fold over and press lightly with a fork to seal. Cut each strip crosswise into (6) 2-inch cookies. Cut 2 slits in the fold side of each cookie. Place on an ungreased cookie sheet, bending each cookie into a slight curve. Bake for 20 minutes, until bottom is browned. Remove from oven and cool on a wire rack. Repeat with remaining dough and filling. Once cookies have cooled, cookies may be iced with powdered sugar blended with just enough orange juice to make a thick icing, or, sprinkled with powdered sugar. My family would always mix the powdered sugar with fresh orange juice, then add red or green food coloring (which always looked mint green or hot pink) and dip the cookies in the icing. Then they would arrange all the cookies on sheets of aluminum foil until the icing hardened up.